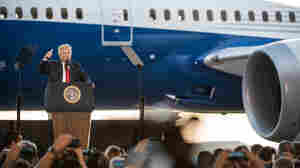 February 28, 2017  President Trump's plans, a rebuke of the prevailing push toward globalization, may overlook what's under the hood when it comes to manufacturing. February 24, 2017  The White House is pushing back on a story that alleged it tried to pressure the FBI to discredit reports of alleged communication between the Trump campaign and Russia. The story, which was reported by CNN, says the FBI resisted those efforts. 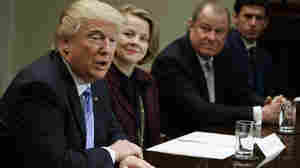 February 24, 2017  Surrounded by corporate leaders, President Trump signed an executive action telling government agencies to slash "job killing" rules. Environmentalists argue the move could undo important protections. February 24, 2017  The Trump administration is denying a CNN report that it tried to enlist the FBI to rebut stories of contacts between Russian intelligence officials and people associated with the Trump campaign. 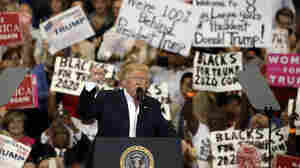 February 19, 2017  After a week of controversy, President Trump sought to energize himself and his supporters at a rally in Florida on Saturday, staged by his campaign operation. February 18, 2017  A month into his presidency, President Trump sounded like candidate Trump at a boisterous rally in Melbourne, Fla.
February 18, 2017  The White House says President Trump is taking his message directly to the people with an event in Florida Saturday that hearkens back to his campaign rallies. February 17, 2017  President Trump and his aides have repeatedly made false claims about crime rates, voter fraud and the threat posed by international refugees. By exaggerating dangers, the White House hopes to justify new government policies. February 17, 2017  It's now four weeks since President Trump was sworn in. Despite setbacks, like the sacking of his national security adviser, Trump is talking about "incredible progress" he's made since taking office. 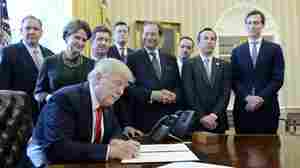 February 16, 2017  Donald Trump's background as a businessperson may not have prepared him for the challenges he's facing in the Oval Office. February 15, 2017  Donald Trump achieved fame and fortune as a businessman and reality TV star. Now he's trying to translate that experience to the White House. Trump's management style has produced a tumultuous first few weeks. On Monday, he effectively told his national security adviser, Michael Flynn, "you're fired." February 15, 2017  President Trump meets Wednesday with Israeli Prime Minister Benjamin Netanyahu, who had considered the former national security adviser Michael Flynn to be an ally in the White House. February 13, 2017  President Trump met Monday with Canadian Prime Minister Justin Trudeau. They were expected to discuss trade, immigration and their very different attitudes toward refugees. February 13, 2017  President Trump on Monday welcomes Canadian Prime Minister Justin Trudeau to the White House, where refugee policy and trade are expected to come up. Meanwhile, Trump's travel ban remains on hold. February 10, 2017  President Trump hosted Japanese Prime Minister Shinzo Abe at the White House Friday. In a joint news conference, Trump defended his controversial executive order on refugees and travel.